Facts, history and information about the life and lifestyles of Native American Indians. 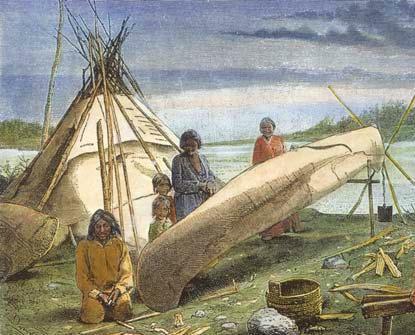 Birch Bark Canoes were the main type and mode of transportation used by the Native American tribes who inhabited the Northeast woodlands, and eastern Canada. The design and style of the birch bark canoes were based on the natural resources that were available to the tribes, in this instance the people made use of the numerous birch trees found in the forests and woodlands of their tribal lands. The tribes built canoes made from the bark of the birch trees over a wooden frame. These canoes were broad enough to float in shallow streams, strong enough to shoot dangerous rapids, and light enough for one man to easily carry a canoe on his back.